Wie können Bürgergruppen & Initiativen rund um die Ostsee zusammenarbeiten? Diese Seite wird gestaltet von am Geschehen im Ostseeraum Interessierten, die sich zwischen 2001 und 2009 an den Aktivitäten des NGO-OstseeNetzwerks beteiligt haben. Wir setzen uns weiterhin dafür ein, dass Aktivitäten der Zivilgesellschaft von dessen Akteuren gemeinsam selbst bestimmt organisiert werden müssen, und niemand sich bloß als Erfüllungsgehilfe staatlicher Interessen verstehen sollte. It could be the right time to celebrate: 11 years ago, March 2011 in Kopenhagen / Denmark, and May 2001 in Luebeck /Germany, NGOs from all member states of the "Council of the Baltic Sea States" (CBSS) gathered and discussed possible common aims and projects. At that time it wasn't sure at all, whether this kind of meetings would have a chance to be continued: the German CBSS-presidency seemed to be afraid of sharing decisions and organisation of these meetings with NGO-represenatives, and consequently 99% the "result" of the Luebeck meeting was made up in advance (= it was a hard stuff to propose any changes during the podium-discussions). Soon the "second-row" administrators, who in the German Foreign Office have to take care of the Baltic Sea Region (as this topic is not a priority in German politics at all) discovered the easy-going use of "symbol-policy": in the aftermath of the 2001-NGO-Forum, the Schroeder Government made sure that German NGOs participated also in the 2nd Baltic Sea NGO FORUM 2002 in St.Petersburg. German-Russian relations count high in Germany, and get much more media interest than all the rest of the Baltic Region. Observation more important than motivation? 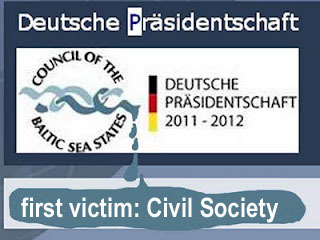 What happens 2012, the year of the ongoing German CBSS-presidency? The German Foreign Office had lost an interest in the uncalculable scene of countless Citizens Intiatives long time ago. And the so called "Baltic Sea NGO network" mutated into a bad copy of governmental administrators: most of the national coordinators of the network feel much more commitment towards official recognition than towards any of the national NGOs. Result: Both sides (government and national coordinators) want something to happen that "looks like" an NGO-meeting (of their own taste): smooth, quiet, without anything extraordinary happening. Result: an NGO FORUM in frame of so called "Baltic Sea Days" (23.-25.April, Berlin - see programme). Those of the hand-selected NGOs who are invited to participate (just a selected part of them who are active in Baltic Sea Cooperation) will be just a false front for German Government's definition of brave NGOs: science and business (in the role of the "good guys"). It is not difficult to understand that science and business are the "better NGOs" in German understanding: both clearly are "non-governmental" and will assure the minimum of what Foreign Office needs for this short term interest in Baltic Sea Co-operation: MONEY and REPUTATION. This "German practice" shows that NGOs are not even required to attend an "NGO FORUM" - there is no common understanding, no common definition and no common law in the Baltic Sea States (on NGOs activities). An NGO-network - if it would have a more reliable base - would never have a common understanding, which could be similar in all CBSS-states. And for the EUs Baltic Sea Strategy encouragement of "Civil Society" is not topic at all! So why to discuss about this Strategy at all, not demanding support for Civil Society should be a seperate topic for the strategy? No, this will not happen so soon, and surely not in Berlin 2012. Better not so speak about it - and listen only to those selected speakers. Science will deliver some nice statistics about what the ruling class of politicians call "Civil Society"; people's activities will continue to be just object of scientists, but not partner. So, who cares at all about this two days Berlin event? 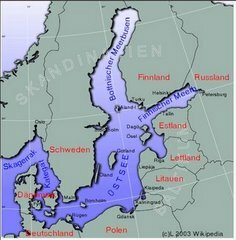 Who will notice in Germany that a Council of Baltic Sea States could improve opportunities for activities of Civil Society? May be the whole CBSS will soon disappear - like the Lithuanian presidency would have preferred in 2010. Germany and German Foreign Office - the second time after the Luebeck Conference in 2001 - will show how big the ignorance of politicians towards Civil Society is. All those people who are truly engaged in their projects, contacts and co-operation in the Baltic Sea Region have to summarize: We would have wanted it to be different. Beside all this short time Berlin glamour their are projects of Citizen Initiatives, youngsters, engaged people. But politicians and governments seem to be very far from encouraging them. Some 200.000 Euro will be spend for just a nice show-up for those who like to pontificate. This money could be used better, that is the only result which seem to be sure. It has been used to pay two young acedemics for pumping up the "German NGO Platform" just for some month, untill the German CBSS-presidency is over. The conclusion is very simply: IF giving money, why not for real NGO's projects? BALTIC SEA NGO FORUM - Will Lithuania bring it to an end? Mit welchem Ostseeland würden Sie gern mehr persönliche Kontakte pflegen? Umweltinitiativen: EUCC - Die Küsten Union Deutschland e.V. Welche Themen sind Ihrer Meinung nach am wichtigsten für den Ostseeraum?